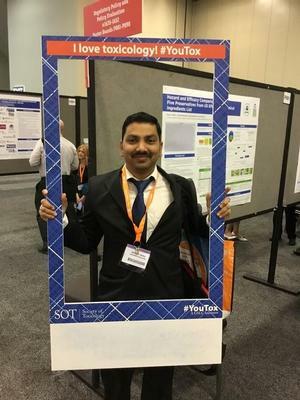 HAMPTON, Va. (January 18, 2019) – Dr. Sainath Babu, Assistant Professor of Biological Sciences at Hampton University, has reached the pinnacle of professional toxicologists as he has been certified as Diplomate of American Board of Toxicology (DABT). This hard-earned recognition in the field of toxicology is considered the peak of professional toxicology world-wide. Among the 2,300 diplomates representing twenty-six different states, Dr. Babu is now one of the representatives. Dr. Babu has done extensive research on Bisphenol A and he is currently working on the toxicity of brominated flame retardant’s and nanomaterials. "I am truly excited about this achievement. It is an accreditation by fellow toxicologists and experts in the field. With recent advancements in predictive computational tools and Organ-on-a-chip, the way we think about of toxicological research is rapidly changing,” said Dr. Babu. “It is my fond hope that many of our current students will follow the lead and become experts in the field." “Dr. Babu is a great example of the talented young faculty we have in the School of Science. We expect that he will accomplish much during his career here,” said Dr. Calvin Lowe, Dean of the School of Science. Dr. Babu has published numerous research articles in peer-reviewed journals and serves on the Editorial Boards of many toxicology journals.